I haven’t worn anything colorful for a long time (my outfits from Canary islands don’t really count, as it was a vacation, not my everyday life), therefore, I couldn’t be more happy about receiving this beautiful floral print blouse from Persunmall. As a lot of you might know- I am a big sucker for floral print and I think that spring is the most appropriate time to wear it! The blouse is made of a very light material and it is very pleasant to the skin! The quality of the blouse is pretty good as well- I checked all the seams and the blouse didn’t seem to have any visible damages or whatsoever! I paired the blouse together with a hot pink skater skirt- I think that the print of the blouse and the color of the skirt go very well together! And on top I also chose to wear my fluffy cardigan that I bought at H&M last year- it has been one of my favorite pieces and I have worn it countless times (for example, here & here). This is so lovely! Gorgeous colors! Very pretty, a great look for spring, the color of the skirt is great and the floral blouse is lovely pigtail is a success because the more power look generally perfect! hope to see you soon on my blog, I invite you to take a vestazo my last post also with floral print, kiss! Simply beautiful! The outfit is so cute and prefect for spring! Love this outfit! It's super cute and young. Love! What a beautiful outfit honey!! you look beautiful! love the color combos :). Such a cute outfit, I love the colors!! So elegant and classy Maddie. Kind of reminds me of vintage Dior! these colors make me so happy! pink is definitely a spring color 🙂 lovely outfit! Maddie , I love this outfit so much! The floral blouse is gorgeous and I love the pink and red together, plus the texture of the sweater is so pretty! You are just looking stunning and full of spring time happiness! I was waiting for you to wear this floral and happy blouse. You look so pretty. Loving the skirt as well. Enjoy the beautiful spring Maddie. I love this outfit! So colorful! <3 The little bag is so cute and it really makes the outfit complete! 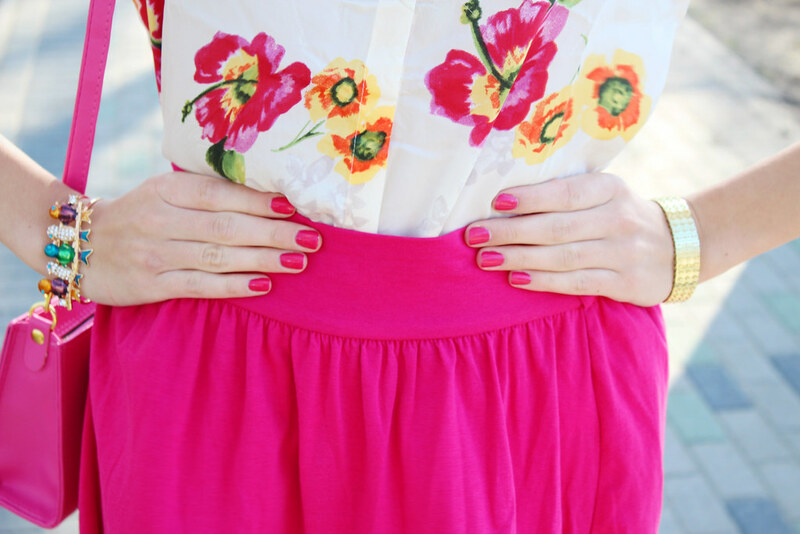 A beautiful way of wearing florals, the skirt is so pretty and I love the bright pops of pink! Wishing you a fruitful week ahead hun! I'm in love with the bright colors! You look spectacular and the bright colors really agree with you! I'm liking all the pinks and florals for spring! 😀 Perfect for a stroll in the park. I hope you can come visit my blog now too and let me know what you think! This is an amazing spring look! Love the colors, the skirt and this amazing bag! Son chic and cool! You are the best interpreter of spring looks! Lovely look Maddie, you are really so pretty ! Wow this is one of my all time favourite looks. It is so gorgeous and beautiful. A stunning colour which really suits you and, of course, florals are one of my favourite prints. Pretty girl. i love florals too maddie. they're so cheery. that top looks fabulous with that skirt. love the bright colors. That floral shirt is so pretty! There are different kinds of florals, and this one has the perfect spacing and color of flowers. Also, what a great idea to include a pink purse with the pink skirt; the off-coloring makes it look so fashion forward. Your blouse is amazing!! I love the flowers and the bright colors. You chose the perfect skirt to go with it too! And your nails even match – brilliant! Lovely bracelet as well, the colors are so bright and pretty. Such a feminine pretty spring look. I love the bright pink cobined with white and small patches of bright colors, it's so summery and positive!